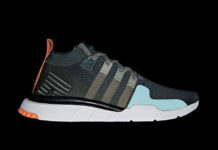 Having a look similar to the African wild horse is this upcoming adidas EQT Support ADV Primeknit Zebra colorway. Releasing as part of the adidas EQT 2017 lineup. This iteration of the adidas EQT ADV Support receives a full Primtknit construction across the upper in a Black and White striped pattern. Finishing off the look is a clean White cage and heel with Turbo Red heel tabs and outsole. Look for the adidas EQT Support ADV Primeknit “Zebra” to release on March 23rd, 2017 at select adidas Originals retailers, including adidas.com. The retail price tag is set at $140 USD. UPDATE: On-feet images of the adidas EQT Support ADV PK “Zebra” that drops tomorrow to select retailers like Titolo. You can also find them available now via eBay. UPDATE: For those that missed the “Zebra” YEEZYs, this adidas EQT Support ADV Primeknit release might be a second option for you. They’ve already started to hit retailers like Renarts set to launch on March 23rd for $140 USD.